This article examines the district-wise and region-wise pattern in the levels of urbanization and industrialization in the state. In order to study the regional pattern, the state is divided into five NSS regions, namely, Northern Upper Ganga Plains (NUGP), Southern Upper Ganga Plains (SUGP), Central Region (CR), Bundelkhand Region (BR) and Eastern Region (ER). The level of urbanization in the state significantly varies between the highest of 38.2% in NUGP and the lowest 12.2% in ER. The number of registered factories per hundred thousand of population is observed to be the highest in NUGP (25.06) and lowest in SR and ER (less than 2.0). The per capita GVA (Gross value added) in the industries has been highest in NUGP, distantly followed by CR and SUGP. It is found to be the lowest in SR, followed by ER. The number of employees in registered factories is highest in NUGP and lowest in SR. It is observed that the 10 districts in NUGP have the highest level of urbanization and industrialization, while ER as a whole is lagging behind the other regions. Regression analysis shows a significant positive impact of urbanization and industrialization on the economic development, measured in terms of composite index of development (CID) and per capita NSDP (net state domestic product). The value of coefficient of dummy for ER indicates that the level of CID and per capita NSDP in ER are much lower than that of other regions of the state. The paper concludes with the observation that there exist inter-region and intra-region disparities in the level of urbanization and industrialization and consequently in the level economic development of the state. The policy implication is that to accelerate the pace of economic development, the focus must be on addressing the issues related to urbanization and industrialization of ER and SR. Also, there is a need to create new manufacturing towns in these regions. Amritsar-Kolkata Industrial Corridor (AKIC), proposed to be set up alongside of Eastern Dedicated Freight Corridor (EDFC), covering 18 districts of the state and the Delhi-Agra-Lucknow expressway have high potential to transform the economy of the state. Credit Suisse. (2013). Annual Report 2012. Retrieved May, 15, 2013 from https://www.credit-suisse.com/…/financial…/financial-reports/csgag-csag-ar-2012-en.p. Ranjan, N. A. (2014). Urban India to contribute 75% of GDP by 2020. Barclays. 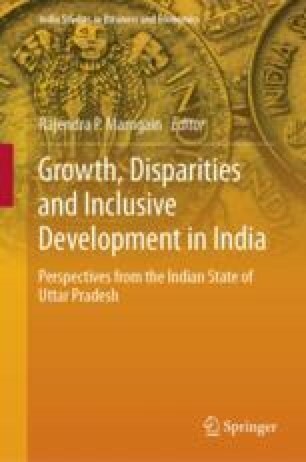 http://urbanupdate.in/in-depth/urban-india-contribute-75-gdp-2020-bracklays.